When I tell people I’m doing field work on the ecology of song birds, I like to think that they imagine remote forests, untrammeled wilderness and not another soul in sight. Well, the trees are green, the birds are singing and the views are beautiful but as it turns out, my study area is a lot less secluded than one might imagine. I work in organic apple orchards on the Western Slope of Colorado and my research sites lay on the edges of small towns. There are lovely homes, slow moving tractors, a busy highway and even a City Market to pick up groceries. But most importantly, there are people. These close knit communities are built around agriculture, art and the beautiful natural surroundings. 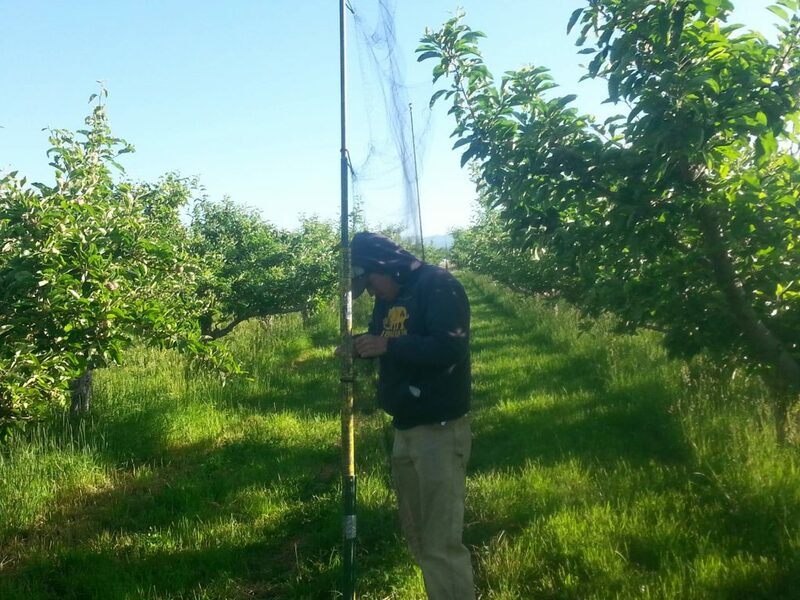 I had the pleasure to collaborate with three fantastic apple growers this year and along with my exceptional field technician, Michael, we had a lot of great experiences gathering data about birds in these orchards. Our field research involved learning about the bird community by surveying for birds and mist-netting (catching and releasing birds by setting up very fine mesh nets), learning about what these birds eat by watching them throughout the day, and measuring apple damage by monitoring trees for bird and insect signs. My goal is to discover the tradeoffs these birds provide in terms of insect pest control vs. bird damage to the apples. Needless to say, we spent a lot of time in these orchards, often working alongside the owners and seasonal workers. Wink and Max own and operate Mesa Winds Farm and Winery in Hotchkiss, CO. They have a beautiful farm, a passion for sustainable agriculture and an appreciation for their role in the ecosystem. There they grow peaches, grapes, a few cherries, and of course apples. On my first visit to Mesa Winds, Wink mentioned one of his favorite birds that frequents the area, the Lewis’s woodpecker. To my excitement, I saw one that very day before leaving the farm. What a great start to the season; this was the first time I had seen a Lewis’s woodpecker – a “lifer”! And what a funky bird; with a dark back, pink underbelly and a wide gray collar around its neck, this bird is quite distinctive. And, unlike other woodpeckers that excavate into wood for insects, Lewis’s will glean insects from tree surfaces or even flycatch its prey right out of the air. Little did I know that these woodpeckers would be one of the most important species for my research. To my surprise, throughout the season, we caught these birds red-handed, perched atop apple trees pecking away at the ripening fruit! Now the question remains, are they also eating the pest insects? By the end of next summer, I hope to have this answer for Wink and Max. As I proceed with my education and field work, I’ll continue to integrate collaborations into my research. It’s clear to me how important these relationships are to developing good questions about the ecosystem and driving quality research to answer those questions. Max and Wink, along with the other farmers, have not only agreed to let me work in their orchards early in the morning, late in the evening and all times in between, but they provide valuable insight into this system. As a newcomer to organic agriculture, I welcomed all tips and tricks about growing apples; did you know most apple varieties need cross-pollination from different varieties for good fruit production? They’re also knowledgeable about the plants and animals on the farm where they live and work, pointing out nests and interesting bird species like the Lewis’s woodpecker. Perhaps the most valuable things I gained from these collaborators were the conversations. So, it may not be an untouched wilderness, but I’m excited for how these collaborations with the farmers who make our food can enhance our ecological knowledge and promote sustainable agriculture as well as avian conservation!